The last set of food industry regulations resulting from the events of 9/11 will be implemented soon. The Public Health Security and Bioterrorism Preparedness Act of 2002 amended the Federal Food, Drug & Cosmetic Act to add Section 414: Maintenance and Inspection of Records. Section 414 is triggered when the FDA has a reasonable belief that an article of food is adulterated and presents a threat of serious adverse health consequences or death to humans or animals, and records are necessary to assist the FDA in making a determination regarding the safety of the food. Except as authorized under the Bioterrorism Act, the FDA is generally limited to inspecting interstate shipping records. In December 2004, the FDA published a final rule regarding new recordkeeping requirements. What products are subject to the rule? The recordkeeping rule applies to human food, animal feed/pet food, food and feed additives and ingredients, dietary supplements, substances that migrate into food from the finished container, and other articles that contact food. Records required under the rule are those necessary to identify the immediate previous sources, and immediate subsequent recipients, of food in order to address threats of deliberate (bioterrorism) or unintentional adulteration of a potentially serious or deadly nature. Existing records may be used to satisfy these requirements, and any system may be used. Records containing recipes, as well as financial, pricing, personnel, research and sales data (other than shipment data regarding sales) are expressly excluded from the final rule. Persons who manufacture, process, pack, transport, distribute, receive, hold or import food in the United States (including food handled in the U.S. for export), and foreign entities that transport food for animal or human consumption in the U.S., are subject to the recordkeeping rule, even if the food does not enter interstate commerce. Persons who distribute food directly to consumers are exempt from establishing and maintaining such “one-step forward” records. For retail food establishments that distribute food to non-consumers, the records are required only if “reasonably available,” meaning there is a system in place to capture the information. Persons who place food directly in contact with its finished container must maintain records on the container. Retail food establishments with 10 or fewer full-time employees, nonprofit food establishments, persons whose activities involve the finished container that directly contacts food (other than packing the food) or other food contact substances, as well as fishing vessels that do not process food, are not required to establish and maintain records. They must, however, provide existing records to the FDA on request. Any farm or restaurant, and any foreign entity who manufactures, processes, packs, distributes, receives, holds or imports food (except those who transport food in the U.S.), are entirely exempt from the rule. Other exemptions include persons whose activities involve the outer packaging of food (no food contact); food regulated exclusively by USDA, food for personal consumption, or food samples for quality assurance, research or analysis purposes. Contact information for the transporter of the food to and from the nontransporter. A transporter may enter into an agreement with a nontransporter (either immediate previous source or immediate subsequent recipient) in the U.S. to establish and maintain the records. The record retention period is based on the shelf life of the food, using criteria similar to the National Institute of Standards and Technology (NIST) definitions for perishable, semi-perishable, and long shelf-life food. The period depends upon the status of the food when released to the immediate subsequent recipient, regardless of the ultimate use and shelf-life of the food. For nontransporters, if there is significant risk of spoilage, loss of value or loss of palatability within 60 days after receipt or release of the food, the record retention period is six months. 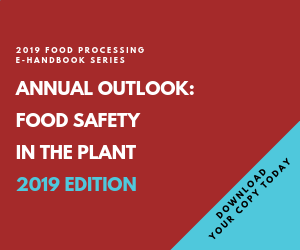 If the shelf life is from 60 days to six months after receipt or release, or if the product is animal food, the record retention period is one year. If the shelf life is six months or more after receipt or release, the record retention period is two years. For transporters, if the shelf life is 60 days after receipt or release, the period is six months. Transporters must maintain records on other food for one year. The compliance date for recordkeeping requirements is December 9 for companies employing more than 500. Companies with fewer than 500, but more than 10 full-time equivalent employees, must comply by June 9, 2006. Businesses employing 10 or fewer have until December 11, 2006 to comply. Records requested in writing under the Bioterrorism Act (FDA Form 482 – Notice of Inspection) must be available for inspection and photocopying as soon as possible, but not more than 24 hours from receipt of the request. Records may be maintained in any readily accessible location, and may be provided electronically, by fax, or by other appropriate means. FDA plans to inform the facility manager of the basis for the reasonable belief that the food is adulterated and presents a threat of serious adverse health consequences or death, unless the information is classified for national security reasons. How will the FDA determine whether the “reasonable belief” standard is met? The draft guidance sets the internal procedures the FDA will follow before requesting access to records under the Bioterrorism Act. The FDA will notify the Emergency Operations Center of information obtained, which will then notify the Center for Food Safety and the Office of Enforcement (OE) in the Office of Regulatory Affairs. The Center and the OE must agree there is a reasonable belief a food is adulterated and presents a threat of serious adverse health consequences or death, and then determine the scope of the request. The Center then consults with the Office of the General Counsel on the determination and the scope of the request. Finally, the OE communicates the decision to the Director of the FDA district in which the food is located. Leslie T. Krasny is a partner at the law firm of Keller and Heckman LLP, San Francisco office. She specializes in food and drug law with emphasis on food safety, food labeling, ingredient evaluation, organics, biotechnology and advertising. She is a member of the California Bar and holds a master’s degree in cell and molecular biology.